Welcome to Downtown Camas . . . 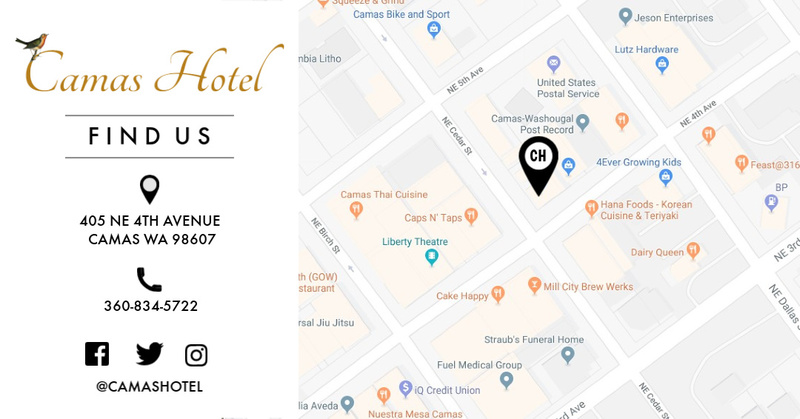 The Camas Hotel is conveniently located in the heart of historical Downtown Camas. Downtown Camas is well known for its beautiful tree-lined streets, unique boutiques and eateries and small town charm. Multiple restaurants and things to do all within walking distance of the Camas Hotel! Stay and Play in Downtown Camas! Salud! is your fun wine bar in Camas, WA. Features a small Kitchen creating amazing bites, fondues, gourmet pizzas (gluten free crust option), cheese and meat boards and desserts that pair perfectly with wine. The best foods to pair with the best wines. Stop by for the live music on both Friday and Saturday evenings from 7-10. Check out fun events in the Bella Vino room! There's always something fun happening at Salud! Three blocks from the Camas Hotel! Craft Brews on Tap and in bottle. Cedar St. Bagel Co. ~ Coming Soon!! Get the taste of New York style bagels in downtown Camas. Serving Breakfast & Lunch. Mexican food for a sophisticated palate. Wine bar, event center, and wine storage. Live music on weekends! Espresso, Smoothies & Sandwiches To Go! Allure is a contemporary women’s apparel and accessories boutique located inside the Camas Hotel! Delivering a unique yet stylish collection of apparel and accessories that change frequently. Allure offers personal service with a friendly and relaxed environment at an affordable prices! Sign up for art classes, art trips to Italy, or stop by to see the latest show! Everything you need for your best friends! Artist's Co-op Gallery with new art shows monthly. Treat yourself to a massage during your stay! Located just a short drive from Downtown Camas is the new landing spot for Norris Arts! Offering original oil paintings and stoneware inspired by the Pacific Northwest. Norris Arts offers a variety of painting and pottery classes taught by Anna and Ted Norris! American cuisine. Serving breakfast, lunch, dinner, and drinks! Production Brewery with pub, serving the Pacific Northwest. brewery serving craft beers and pizza! Fresh, local ground beef hamburgers, hand-cut French fries and hand-scooped ice cream shakes. House made Irish cuisine combined with a fresh craft cocktail bar. Authentic Mexican Cuisine featuring a cantina! Northwest BBQ with a twist! Long-running American family eatery prepares homestyle comfort fare including all-day breakfast. Vibrant, tropical hangout with a deck offering Caribbean cuisine & cocktails at a riverfront marina. Throwback spot for burgers & other American grub in a no-frills interior or to-go from a drive-thru. Neighborhood hangout featuring American fare made with ingredients from area farms & local beer. Serving breakfast and lunch! Known for wool apparel & blankets, this chain also sells non-wool clothing, decor items & linens. Rich in the history and culture of our past. Operated by the Camas-Washougal Historical Society. Look no further than Lisa Lê Properties! Lisa is an experienced and knowledgeable real estate broker located right across the street from The Camas Hotel! Contact Lisa to start searching for your Camas Dream Home! Across the street from The Camas Hotel!